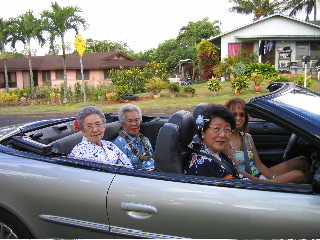 Left to Right : Back Seat : Kimiko Sugibayashi, Ramona Cruzada. Front Seat : Fujiko Mamura. THE ELDERS OF HANAMA`ULU, 80 and older, represent the hardworking employees of Lihue Plantation who have made Hanama`ulu home for decades. Many raised their children in this peaceful plantation town. And those children and the children's children went on to higher learning and are contributing members of the communities where they live today, including Hanama`ulu. 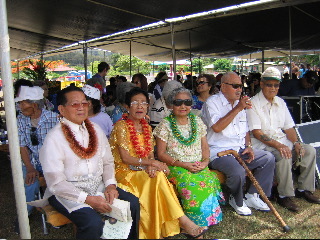 These old-timers were honored in appreciation for decades of residency in Hanama`ulu and in gratitude for their contributions to the communtiy. 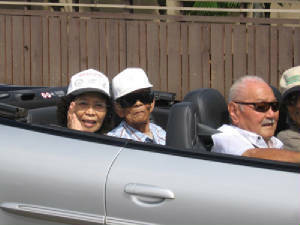 As grand marshals of the Hanama`ulu Town Celebration Parade, the first-ever parade in town, they rode in convertibles and vintage cars. Consorcia Estenzo (partly hidden), Gayle Bakiano. Shortly after the beginning of the program that followed the parade, Mayor Bryan Baptiste, assisted by Eddie Sarita, Chairman of the Hanama`ulu Town Celebration, and Flo Abrams, member of the Program Committee, presented the Grand Marshals with framed Certificates of Recognition that featured the logo of the celebration. In addition, the Grand Marshals received copies of the souvenir booklet. And volunteers came to the rescue! Recruited to present the leis and caught on camera by Bruce Smalling of Wala`au, was Eleanor (Ellie) Pascual Ibia, who with her husband Ray made the trip from their San Jose (CA) home to help with the celebration. Murphy's Law ("Anything that can go wrong, will go wrong .") threatened to prevail! With the leis still untied, Ellie recruited Laraine Moriguchi of SignArt fame, who happened to be seated on the aisle next to where the ceremony was being held, to please tie the leis. And the leis were presented seamlessly, with only Ellie and Laraine aware of the emergency. The leis, which were ordered by Cathy Simao for the Program Committee, were made by Vicky Ramos. The certificates were produced by Catherine Pascual Lo for Dely Pascual Sasaki, member of the celebration Program Committee. Born in Santa Cruz, Ilocos Sur, Philippines, Francisco (Frank) Agader came to Hawaii in 1931 as a young man of 23. He lived on Molokai and in Pakala briefly before coming to Hanama`ulu in March 1932 to work for Lihue Plantation, first as a herbicide worker and later as a tractor driver, and retired after 40 years of service. Helen Agader (nee: Sueko Saiki) was born in Wailua in 1921. He married Frank in August 1941, and they raised three children -- Karen now of Lihue; Milton, now of Waialua; and Jeffrey now of Mililani. The Agaders have seven grandchildren and four great-grandchildren, all of whom live on Oahu, where the Agaders visit often. Helen, now 84-years-old, worked at Kaua`i Surf for about 25 years before retiring in 1986. The Agaders are frequent visitors to Las Vegas where they enjoy the sights and food. Now 97-years-old, Mr. Agader must be the oldest Black Jack player in LV when he visits there. Obituary: Helen Agader (Mar. 6, 1921 - Nov. 7, 2006) TGI, 11/15/2006. Alice (nee: Sa) was born and raised in Hanama`ulu. Henry, who was a supervisor at Hanama`ulu Shop for 47 years, grew up in Kealia. The Arrudas have three children: Nadine (Mrs. Horner), Darryl, and Kelly. Henry and Alice Arruda are devoted members of Immaculate Conception Church at Kapaia. And Alice continues to carry on the Portuguese tradition of making delicious homemade malasadas which her beloved mother Emelia Sa started. BORN IN KOLOA to Agapito and Petra Bakiano on November 28, 1922, Greg grew up in Hanama`ulu, his father having been assigned to Lihue Plantation after two years with Koloa Plantation. The Bakiano Family first lived at Camp 9, which was located about three miles from the Lihue end of Maalo Road. About 1927, the family moved to a house across Hanama`ulu School from which Greg graduated. He has the distinction of being the school's only alumnus who became a police officer. Gayle Bakiano was born on the Big Island of Hawaii. The Bakianos moved to their own home in Hanama`ulu in 1957. They have a son and daughter, both of whom live in Seattle, Washington, with their families. Greg retired after 25 years of service with the Kauai Police Dept. Gayle retired after working for Wackenhut as a security officer at Lihue Airport for 12 years. Today, the Bakianos enjoy traveling and taking care of each other. DOROTHY (Dora) was born in Hanama`ulu in 1923. The daughter of John, who was a luna, and Georgina (nee: Travasso) Garcia, she grew up in Hanama`ulu. Two years after World War II, Dora married Augustine (Jiggs) Cataluna and they raised two daughters and a son, partly on Oahu, and mostly in Hanamaulu, where they bought a home in 1956. Dora's uncle, John Travasso, who retired on July 1, 1955, after 29 years as Lihue Camp supervisor (i.e., police) worked for Lihue Plantation for 50 years. Her other uncle, Joseph Travasso, was camp police at Lihue and Hanama`ulu in the 1940s and 1950s. Obituary: (Jan. 24, 1923 - Jan. 31, 2007) TGI, 02/08/2007. Ramona Cruzada and her late husband, Restituto, settled in Hanama`ulu in 1939 after their marriage. Restituto worked for Lihue Plantation as a truck driver for 43 years. The Cruzadas' six children live on three islands and three states: Gloria, Lanai; Russ, Oahu; Ronnie, Kansas City, Missouri; Allan, Porland, Oregon; Larraine, Oahu; and Sheila, Kauai. Ramona, 88-years-old, has lived in Hanama`ulu for 66 years. She has 14 grandchldren, 12 great-grandchildren, and two great-great-grandchildren. Obituary: (Feb. 28, 1917 - Oct. 1, 2008) TGI, 10/04/2008. Born on June 22, 1923, at Nukoli`i, at the site of the Lihue Dairy, also known as Hanama`ulu Dairy, Consorcia is one of four children born to Zacharias and Felipa Bacalso Labez. Her father was the first Filipino luna at Lihue Plantation and also served as Hanama`ulu camp police. and remembers her family raising vegetables, chickens, and pigs. Constance or Consing, met Sotero Estenzo, who was from Molokai, when he came to Kauai to play baseball. They got married in 1936 and moved to the Philippines with the rest of the Labez Family. However, in 1969, the Estenzos returned to Hanama`ulu with their seven grown children. THE MADRIDS arrived from Bacarra, Ilocos Norte, in 1946, with three children. The family settled in Hanama`ulu, where five more children were born. The first of their three sons, Angel, was a member of the famous Whiz Kids of Hanama`ulu, and one of their five daughters, Abelina Madrid Shaw, who has a master's degree in communications and a doctorate in law, has distinguished herself in public service on Oahu. Venancio Madrid, born on January 19, 1919, was first employed by Lihue Plantation as a sugarcane seed planter. He retired in 1984(?) as a truck driver. Rosenda, born on May 1, 1919, and Venancio are both 87-years-old and have 13 grandchildren. They are also blessed with great-grandchildren. Retired secretary for the Dept. of Education, Special Education Dept.. To keep physically fit, she walks four times around King Kaumauali`i School and sometimes around Peter Rayno Park. Husband "Jimmie" Misuku Mamura was born and raised in Hanama`ulu, graduated from Hanama`ulu School, Class of 1930. He worked 40 years for Lihue Plantation Co. as a mechanical draftsman at Lihue Sugar Mill. The Mamuras, with their three children, enjoyed camping and picnicking at beautiful Hanama`ulu Beach. Fujiko Mamura, who feels Hanama`ulu is a great place to live, says, "Yes, Hanama`ulu no ka oi!" WHENEVER LIHUE CAFE is mentioned, old-timers think of Harry Miyake and his sister Lillian. Today, his son Gary manages the cafe. Harry's brother Roy has the Hanama`ulu Cafe connection. Their father Sakari Miyake (1888-1974) was the second owner of Hanama`ulu Cafe, which has been owned and managed by three generations of Miyakes since the mid-20s. Harry used to live in Gardena, California. He lives in Lihue today. For more information, see "Remembering the Past ... " below. MAXINE (nee: Maximina Bangloy), and her late husband, Absalon "Chicago" Pascual, were blessed with five daughters, who distinguished themselves in their chosen careers. As one of the Grand Marshals of the Hanama`ulu Town Celebration Parade, she rode in a 1948 Chevy Coupe, which once belonged to her husband. Her son-in-law Ray Ibia and youngest daughter Eleanor made the trip from their home in San Jose, CA, to attend and to help with the celebration. Ray, who is now caretaker of the Coupe, drove Maxine in the parade. Arriving in February 1954 with her five daughters to join Chicago on Kauai after eight years of separation, Maxine became known as Caleb and Florence Burns' cook at Iliahi, the mansion above the German Forest in Lihue. Caleb Burns was the manager of Lihue Plantation from August 1933 to April 1951, and he and Mrs. Burns lived at Iliahi until 1967, when they moved to Oahu and took up residency at Pohai Nani. After Iliahi, Maxine worked at Woolworth's as a cook until she retired in 1975. At 90, Maxine continues to cook, sew, quilt, and garden. Maxine's love for cooking stems from the fact that she and her husband owned and managed the Plaza Lunch, a restaurant and catering business in Laoag in northern Luzon, Philippines. Located in the heart of what is now Laoag City, it became the meeting place of prominent citizens of Laoag and neigboring towns. The Plaza Lunch was an unqualified success for many years until it became a casualty of War War II. Absalon Pascual's desire to rebuild and his need for capital brought him to Hawaii in 1946. ILOCOS SUR, PHILIPPINES, was home to The Quels until 1946, when they came to Hawaii. They have three living children, 10 grandchildren, and 23 great-grandchildren. Luis worked for Lihue Plantation as a truck driver for 20 years, for Kaua`i Surf as a cook for 12 years, and for Sears Roebuck as a saleman for five years. A "Jack-of-all-trades," he worked as a carpenter, helping fellow Filipinos build additions to their homes, after his retirement. Mrs. Quel (Ising) worked for Sharon Sue Store and Robert's Store as a salesclerk and seamstress. Today, she and Mr. Quel continue to be active and travel to the mainland and to the Philippines often. Born in Hanama`ulu on March 5, 1922, to Ignacio and Juliana Padre Madrid, who came to Kaua`i in 1919, Isabella attended Hanama`ulu School until the age of nine, when her parents and siblings moved to the Philippines. That was in 1931. Isabella's fondest memories of her birthplace were of times spent picking opihi and fishing at Hanama`ulu Beach. Isabella and her husband Rosendo Fernandez Ramelb came to Hawaii in 1946 with their sons Aurelio and Patricio, ages 5 and 3. They settled in Hanama`ulu and Rosendo worked for Lihue Plantation for 27 years until his retirement in 1973. However, for Rosendo it was his second trip to Hawaii, having come in 1928 with his brother Felix. After briefly settling in Mana, Rosendo lived in Hanama`ulu and worked for the plantation until 1939, when he returned to the Philippines. The Ramelb Family consists of five sons, two daughters, seven grandchildren, and five great-grandchildren. Isabella Ramelb worked at Wilcox Memorial Hospital as a certified nurse's assistant. Before her employment at Wilcox in 1965, she worked at Nawiliwili Harbor packing tuna, at Pineapple Cannery at Kapaa, at Tip Top Cafe and Bakery baking bread, and at Kauai Surf as a chambermaid. Isabella Madrid Ramelb's secret of youth is the intake of lots of vegetables, like pinacbet. Also fruits, like mango with rice. She enjoys meeting people, talking story, and taking care of her great grandchildren. BORN IN MAKAWELI to immigrant parents, Yohachi and Shika Saito from Japan, Kimiko was the sixth in a family of eight children. Her father worked for the Hawaiian Sugar Co., often referred to as Makaweli Plantation. She attended and graduated from Makaweli School and Waimea Junior High School. She would have continued her education at Kauai High School, but transportation difficulties from Makaweli to Lihue in the early 1930s made it impossible for Kimiko to continue her education. However, in 1956 she received her high school diploma through the adult education program of the Dept. of Public Instruction of the Territory of Hawaii. In 1938, Kimiko married Yoshizo (Lindy) Sugibayashi, who worked for Lihue Plantation. At Lihue, the couple raised three sons, two of whom live in Honolulu and one calls Kwajalein home today. The Sugibayashis moved to Hanama`ulu in 1967. Employed by Ideal Cleaners in Nawiliwili for a number of years, Mrs. Sugibayashi retired from Yukimura's in 1979. She joined the Lihue Seniors after she retired and continues to enjoy the senior programs today. 1. Biographical information submitted by the grand marshals or their families to the Hanama`ulu Town Celebration Parade Committee. 2. "Hanama`ulu Town Celebration 2005" [Souvenir Booklet]. 3. "The Garden Island" (Newspaper). 4. "The Lihue Planation News" (Monthly Publication). 5. Various sources, including Talk Story and the author's personal knowledge. Obituary: (Died Feb. 12, 2009) THA, 02/15, 2009. IF YOU HAPPEN TO BE READING THIS AND TOOK PICTURES OF THE GRAND MARSHALS, PLEASE FORWARD THOSE PHOTOS AS ATTACHMENTS TO E-MAILS AND THE WEBMASTER WILL POST THEM. MAHALO!